Listen to Laura's interview (and Like I've Never Been Gone) on BBC Radio Northampton, 20 December 02. 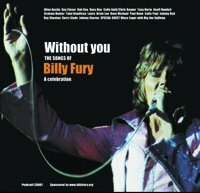 This stunning double CD marked the end of our 20th year without Billy Fury. AVAILABLE ONLY FOR DIGITAL DOWNLOAD, complete with all artwork, for �99. Clicking the button below will take you to a page for payment through Paypal, following which you will be able to download the complete package to your computer. There is also a very special (and singular) bonus track. Several leading figures in the music world have been kind enough to send messages for inclusion in the booklet accompanying the CD. These include Sir Paul McCartney (who has also given permission for a photograph taken of him by Linda McCartney to be used), Sir Cliff Richard, Joe Brown, Tommy Bruce, Marty Wilde, Vince Eager and Stuart Colman. This site is financing the production of the album, and any profit will be donated to the Billy Fury Bronze Fund. I can also post overseas and accept payment in US $ or euros. Please e-mail xxxxx@xxxxxxxx for details..